I admit I asked Jon to write a guest post for me ages ago. I’ve written a few for him but he has been too busy with writing his amazing book, which I will be reviewing soon with a very special give away. Anyways, he is finally giving me the guest post, along with like 130 other people. 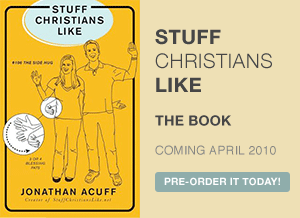 To add up your score with over 130 other ideas on this scorecard, visit stuffchristianslike.net. Weekend, we don’t need no stinkin’ weekend.